On April 16, 2018, the Durham, North Carolina City Council passed a statement on policing, which made Durham the first city in the United States to ban police trainings specifically with Israel. Council member Mark-Anthony Middleton has repeatedly and publicly said that it was unnecessary to single out Israel in the statement. Public record requests reveal that Mayor Steve Schewel and Mayor Pro Tempore Jillian Johnson both described this policy as the “Israel resolution,” making clear the true intent of the statement. Johnson sent 46 emails to residents explaining it is a “statement affirming a city policy against police exchanges with Israel.” The April 16 statement continued Johnson’s use of Durham City resources, which started in 2015, to promote boycotting Israel. Ten days before the City Council passed its anti-Israel statement, activists led by the self-declared “anti-Zionist Jews” of Jewish Voice for Peace (JVP) provided the Council with a petition urging that Durham specifically boycott police trainings with Israel. Multiple versions of the petition stated that Israeli training “helps the police terrorize Black and Brown communities here in the U.S,” which the Mayor later acknowledged is false. Six out of seven council members had already signed various versions of the petition. A local Jewish leader informed me that Council person Johnson told him that she had even helped rewrite the petition that activists brought to the Council. As Middleton publicly admitted minutes before voting to approve the statement, the Council’s April 16 statement was a “compromise” with JVP. In November, the four-person HRC subcommittee formed to research this matter concluded a six-month investigation by issuing a draft report that found the Council at fault in multiple ways. Most importantly, the draft report recommended the Council remove the singling out of Israel from its April 16 statement. The report also faulted the Council for contributing to “tension in our community,” fast-tracking anti-Israel policy, waiving Council policy for anti-Israel activists, using personal email to conduct public business, and not properly alerting the public that Israel was a planned focus of two City Council meetings in April. Judea Reform Congregation in Durham, the largest synagogue in the area, thanked the HRC for its “thorough and thoughtful report” and stated, “It is our hope that the full HRC, and subsequently the City Council, will adopt the recommendations of your subcommittee as submitted, especially the rewrite of the Council Statement that omits the unnecessary and disruptive reference to the State of Israel. These recommendations go a long way to correcting misinformation and the pain felt by many in the Jewish community.” Durham’s Mayor Steve Schewel, who wrote the “Israel resolution,” is a member of Judea Reform. Schewel’s own congregation strongly objected to his singling out of Israel. The Jewish Federation of Durham-Chapel Hill (representing thousands of local Jews), Kehillah Synagogue (the largest Jewish congregation in nearby Chapel Hill, NC), Beth El Synagogue (the second largest Jewish congregation in Durham), and Hillel (the organization that represents Jewish life for students on 13 campuses across North Carolina) wrote to the HRC in support of the November HRC draft. Many others wrote letters – including two Holocaust survivors, Christian allies, Latino and African-American leaders, and progressive leaders – requesting that the HRC approve its November draft report. On January 6, 2019, just two days before the HRC was scheduled to vote on its report, the HRC issued an updated draft report that rejected its own recommendation that the City Council remove the singling out Israel from the April 16 statement. The updated draft included the shocking admission by the HRC that, because the Durham City Council has publicly said it refuses to revisit this issue, the HRC felt it pointless to proceed and instead decided to renege on its earlier recommendation. In essence, the HRC said that because the Durham City Council wants this issue to go away, it would oblige by not holding them accountable. I attended the January 8 HRC meeting and sat in the front row, only feet away from the commissioners and two City Council members, who sat with them. It was clear that a number of commissioners had not read or seen the updated report. At least one commissioner was confused and thought the earlier November report, calling on the City Council to remove the singling out of Israel, was still the current report. The meeting was disorganized. The building and room location was changed only hours before the meeting began. Only 20 chairs were provided for the public, when about 100 chairs were needed. There was not a single microphone. The meeting began 30 minutes late with repeated pleas and interruptions from the public to “speak louder” and “we can’t hear you.” Voices were difficult to hear and indeed inaudible at times, even in the front row. Chairs were brought in and a single microphone was finally provided, connected to a single small amplifier, that the commissioners and public all shared. The subject matter before the Commission was also allowed to go off track. The issue before the Commission was discrimination. The mainstream Jewish community brought concerns to the HRC because the Durham City Council in its actions and conducts discriminated against the Jewish community in Durham. The HRC responded by turning the meeting into a referendum on Israel and the Palestinians. A number of commissioners used this time to speak out for Palestinian rights, ignoring the actual merits of the complaint filed with the HRC. During the entire process, the HRC allowed anti-Israel activists to act as self-appointed surrogates for the City Council. One HRC Commissioner, Andrea M. Hudson, took the lead at the January 8 meeting in supporting the City Council and making this issue about Palestinian rights. Hudson put forth the bizarre and troubling position of comparing the April 16 anti-Israel statement to the bible and stated that even if commissioners disagree with the statement, they should not ask for the government to change a policy it had written because, like the bible, the policy had already been written (see video). HRC Chair Diane Standaert did not step in to remind commissioners that City Council statements are not religious edicts and that comparing city policy to holy scripture is deeply offensive to many people of faith. Only one commissioner, Ricardo Correa, had the courage to speak up (see video). Correa reminded Hudson, “There is an accountability to government officials. They can retract this statement if we know it is offending and hindering part of the community.” Correa described the statement as discriminatory and said, “The fact is that we can go back to City Council and say, ‘Your statement is bringing hurt to the community. Would you be mindful and thoughtful about your wording.’” Correa told Hudson and the public that the April 16 statement on policing in Durham “has nothing to do with Israel” and that Israel can and should be removed. Correa pointed out that people reading the April 16 City Council statement will get the ignorant idea that police violence in Durham is caused by Israel when, he says, “The blame is this country [the United States].” Correa stated that the only foreign country targeted by the City Council and the HRC is Israel. Correa asked why, for example, the Council and HRC are silent while thousands of Hispanics are murdered across the globe. The room was silent; no one answered. As Correa was speaking to Hudson, she stood up and left the meeting. We were disappointed throughout the meeting that the four HRC commissioners, who signed the anti-Israel petition given to the City Council, did not state their conflict of interest during the more than two hours of discussion on this topic. Petition signatories included Diane Standaert (Commission Chair) and John Rooks (Commission Vice Chair). The other two, Andrea Hudson and Mikel Barton, were on the HRC subcommittee that was setup to research this issue and write the HRC report. Thus, half of the subcommittee members tasked with researching City Council discrimination against Israel were anti-Israel activists, who reported to a Chair and Vice Chair, who are also anti-Israel activists. One subcommittee member did not show up for the January 8 HRC meeting, meaning that a majority of subcommittee members present were anti-Israel activists. When one HRC commissioner suggested that the subcommittee meet again and then issue an updated report to be voted upon at another meeting, Commissioner Hudson convinced the HRC not to do so, saying it would not change the outcome. Commissioner Andrea Hudson publicly supports the renowned anti-Semite Louis Farrakhan. Recently, she posted on Facebook, “Minister Farrakhan always speaking truth!” I contacted Hudson and the other HRC commissioners about this post the day of the HRC vote. Hudson did not respond – nor did any other HRC commissioners. Instead, Hudson made her Facebook account private. 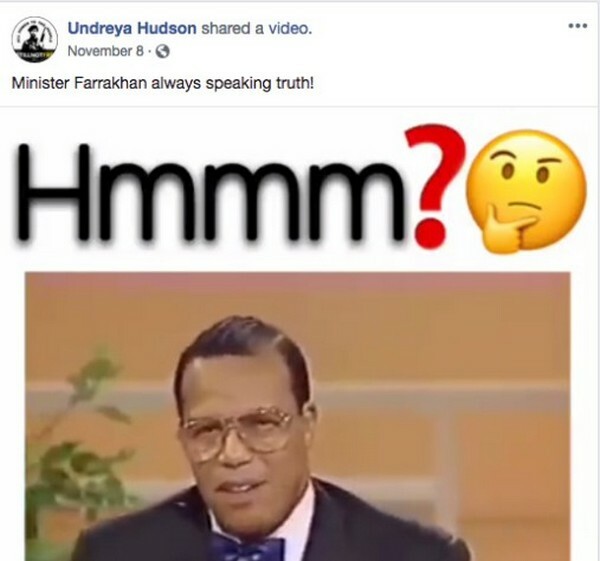 On Facebook, Hudson has complimented a local Nation of Islam leader, Rafiq Zaidi, who on April 16 told the Durham City Council that Jews have a “synagogue of Satan” and hold “an inordinate amount of control” over politics. Even Mayor Schewel, the very man who chose to make Durham the first city in the country to ban police trainings with Israel, publicly accused Zaidi of anti-Semitism. Commissioner Mikel Barton was listed on a fundraising site for the local chapter of Jewish Voice for Peace as a recent donor – the very group that led the anti-Israel petition and lobbied the City Council to boycott police trainings with Israel. One of the four subcommittee members, Susan Austin, tasked with researching this report and issuing recommendations to the HRC, did not attend the January 8 HRC meeting or vote. Austin, notably, is the only Jewish commissioner on the HRC. Not a single HRC commissioner at the January 8 meeting was Jewish, yet all but one felt comfortable ignoring our Jewish leaders and Jewish institutions and telling Jews, who have been discriminated against, that everything is fine. The HRC voted to approve the updated draft report, thus rejecting their own recommendation made in November that the Durham City Council remove the singling out of Israel from their April 16 statement. Several members of the public expressed concerns to me that four City Council members were present, which they feared was intimidating to HRC commissioners. The City Council is responsible for appointing and, on occasion, removing HRC commissioners. As a member of the public asked me, how could the HRC be expected to find that the Durham City Council acted in a discriminatory way, when a majority of Council members were present and closely watching, with two of the Council members choosing to sit at the table with the commissioners? The Durham City Council’s unnecessary attack on Israel, followed by the Durham HRC’s endorsement of discrimination, has brought the gift of unity to the Jewish community. The local rabbis, synagogues, and Jewish institutions are standing together against discrimination. The Jewish community has deepened our interfaith ties and friendships with local African-American and Latino communities. Adversity has brought new friends, strength, and unity to the mainstream Jewish community of Durham, NC and surrounding areas.